Most people don’t think about the health of their feet until they start hurting. However anyone who has uttered the phrase, “Oh, my aching feet,” understands how foot discomfort can literally stop you in your tracks. Although often underappreciated the foot is a complex engineering marvel. Consisting of some 26 bones and an intricate framework of muscles, tendons, and ligaments, your foot is designed to allow you to stand, walk, run, jump and absorb the tremendous forces that are generated every time the heel hits the ground. According to the American Podiatric Medical Association the average person takes 8,000 to 10,000 steps a day. This means that by the age of 50 most individuals in relatively good health will have walked approximately 75,000 miles. That is a lot of activity and stress. 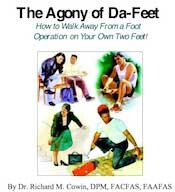 It is hardly surprising then that most individuals at one time or another will experience an annoying or painful foot problem. Unfortunately, well beyond discomfort, a disruption of your normal foot mechanics can also impair balance, reduce mobility, and impact other parts of the body. One of the most common foot problems seen by podiatrists is a bunion. Typically recognized as an unsightly bump at the base of the big toe, a bunion is in fact a deformity of the framework of the foot. It develops when the joint at the base of the big toe becomes unstable, causing both the bone and soft tissues to move out of place. The bunion’s characteristic bony knob appears on the inside of your foot as the top of the long bone that is just behind the big toe (the first metatarsal) angles outward and the big toe angles inward toward the smaller toes. Less frequently occurring is a bunion that develops at the base of the little toe on the outside of the foot. This is known as a tailor’s bunion or bunionette. Although bunions are more commonly seen in women, anyone can develop one. Foot mechanics that put too much pressure on the big toe joint may be the basis of the disorder. Your risk of developing a bunion can be increased by such factors as the way you walk, your inherited foot type, wearing ill-fitting or certain styles of footwear (e.g. high heels and pointy-toed), as well as having an occupation that puts a lot of stress on the feet. Additionally individuals with injuries to foot alignment, neuromuscular disorders, congenital deformities, or joint conditions may be more likely to develop bunions. If you suspect that you have developed a bunion, it is important to see a podiatrist. While the symptoms tend to develop gradually, if not treated correctly a bunion can get progressively worse and become both disfiguring as well as debilitating. As the big toe joint bears a majority of the body weight with every step that you take, a bunion can lead to significant problems. Over time with continued pressure and irritation the initial small bunion at the base of your toe can become swollen, red, and painful. The overlying skin often thickens as corns or calluses develop. Left ignored and without the appropriate foot care to slow or stop the progression, a bunion can widen your foot, make wearing shoes more difficult and prevent you from going about your daily activities. Your shifting big toe can put so much pressure on the smaller toes, that they too develop abnormalities. Moreover toe joint damage can cause stiffness, bursitis, or arthritis and give rise to additional complications. Your podiatrist will evaluate your bunion and develop a treatment plan. After confirming the diagnosis and determining the severity of your bunion, the podiatrist will take steps to alleviate the symptoms, and stop it from worsening. If these treatments fail to provide relief and your bunion symptoms are becoming so severe to the point of interfering with your daily life, surgery may be necessary. Most patients who undergo bunion surgery experience a significant reduction of symptoms along with a much-improved alignment of their big toe. There are a number of surgical procedures available to remove the bump, correct the bony and soft tissue changes in the foot, and bring your big toe back into position. The podiatrist will discuss with you which of these best addresses your deformity and situation. You will also be informed as to what you need to do post-operatively to optimize the success of the procedure, as well as what to expect in terms of recovery time. Taking a proactive approach to the health of your feet is far simpler than waiting for a problem to develop. Maintaining your feet for the long run depends on how well you treat and care for them today.